A close-up of Jupiter’s Great Red Spot taken by the JunoCam instrument on NASA's Juno probe, and color-enhanced by citizen scientist Jason Major. Jupiter's Great Red Spot has swirled for hundreds of years, but the source of its distinctive color remains a mystery. New laboratory experiments are working to produce that color — and others found in Jupiter's stormy cloud tops — here on Earth, and researchers have found that radiation and temperature play key roles in changing the color of some of the transparent material found in the clouds. A primary suspect in coloring Jupiter's clouds is ammonium hydrosulfide, a type of salt. Formed by ionized ammonium and bisulfide, it quickly decomposes at typical atmospheric conditions and temperatures on Earth, making it challenging to investigate its properties. The scientists have run about 200 experiments on ammonium hydrosulfide in an attempt to match the color of the Great Red Spot. After hitting the salt with simulated cosmic rays, they compared them to observations made by NASA's Hubble Space Telescope. "This work took a bit because there is not much published on this compound, and there appeared to be a lot going on in the sample," Loeffler said. Jupiter's Great Red Spot, imaged by the Voyager 1 probe in 1979. With winds as high as 400 mph (644 km/h), Jupiter's Great Red Spot has been brewing for at least 150 years. Astronomers in the 1600s identified a blurry feature on Jupiter that may have been the spot, but scientists aren't certain that it was the same storm. In recent years, the storm has shrunk to the width of a single Earth. Previously, it was estimated to be three Earths wide. At the same time, observations showed that the color of the spot has been changing, suggesting that its composition may also be shifting. Though ammonium hydrosulfide is present in Jupiter's atmosphere, Loeffler said, it doesn't exist as a gas. Instead, it must be condensed as grains of salt that are mixed with or coat another material. By itself, ammonium hydrosulfide is transparent and colorless. But in Jupiter's clouds, the salt doesn't sit in isolation. Cosmic rays, the high-energy radiation traveling through space, bombard the planet and its clouds. These rays, which come from outside the solar system and even outside the Milky Way galaxy, can change the color of many salts, as previous experiments have revealed. To determine how ammonium hydrosulfide reacted to radiation, Loeffler and Hudson first had to cool the sample holder to temperatures where the salt would remain stable as a solid. Then, they sprayed ionized ammonia and hydrogen sulfide into the sample holder, where the two components reacted to produce the salt. Next, the researchers used a particle accelerator to bombard the sample holder with protons to represent cosmic rays impacting the cloud. Throughout the process, the researchers monitored the ice and collected images in both visible and ultraviolet light. Most of the nearly 200 iterations of that experiment took what Loeffler called "a long day," though some ran overnight. Loeffler summed up the process in a single word: "fun." The researchers found that varying the temperature of the "cosmic rays" affected the color of the salt. At low temperatures of minus 263 degrees Celsius (minus 441 degrees Fahrenheit) and minus 223 degrees C (minus 370 degrees F), the salts became orange or reddish orange. At higher temperatures of minus 153 degrees C (minus 244 degrees F) and minus 113 degrees C (minus 172 degrees F), the salts turned green. The researchers attributed that greenish tint to sulfur. Only a small fraction of sulfur has been identified in the clouds, however, at smaller ratios than those found in the salts produced in the lab. Samples of ammonium hydrosulfide hit by simulated cosmic rays vary in color from red to green. From leftTop left,: S sample at 10 Kelvin; top right, sample at 50 Kelvin; bottom left, sample at 120 Kelvin; bottom right, sample at 160 Kelvin. 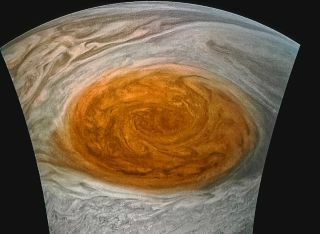 That provides an interesting challenge, Loeffler said, because the Great Red Spot is thought to have a temperature closer to those that produce the greener salts, though the clouds clearly are red. "It would be nice if the red colors we see at low temperatures could be [responsible for] the Great Red Spot, but those are probably too cold," Loeffler said. So what role does ammonium hydrosulfide play in coloring Jupiter's legendary storm? The researchers still aren't certain. The visible color of the ammonium hydrosulfide (whether red or green or something in between) is determined by the wavelength of light that the compound emits, but the full profile of light coming from the compound includes wavelengths beyond just that visible range. So the researchers are comparing that full wavelength profile of ammonium hydrosulfide at different temperatures and doses with the full profile of light coming from Jupiter's Great Red Spot. Although the ammonium-hydrosulfide ice at low doses and low temperatures makes a "reasonable match" to what has been observed on the planet at some wavelengths, it doesn't match all the wavelengths scientists have seen in Jupiter's storms. Ices irradiated at higher temperatures make a better overall match, but the wavelengths that create the greenish color are obviously a mismatch with what Hubble has seen. "After comparison with this new low-temperature data, it seems evident that the best fit of a single [ammonium sulfide] ice is one that has been irradiated and warmed up to higher temperatures so as to remove the [sulfur] radical," the researchers said. Pointing to a 2016 study he worked on, Loeffler said warming the green samples to temperatures matching those found in the cloud layer of clear, unirradiated ammonium sulfide gets rid of the unattached sulfur ions and the greenish color. That study, along with another paper from 1976, focused on only a single temperature when the sample was irradiated. Along with the new research, which will appear in the March 1 issue of the journal Icarus, these are the only papers that report the results of laboratory work on ammonium hydrosulfide, according to the authors of the new study. That's because the instability of the salt makes it a challenge to work with, Loeffler said. "Also, the material smells bad — think rotten eggs and cleaning solution," he said. "For safety, all the excess material has to be vented out of the room, so no one breathes it." Even worse, he said, the samples destroy lab components. "It really is not the best material to work with," Loeffler said. But that doesn't deter the scientists. Now that they've studied how ammonium hydrosulfide changes over a range of doses and temperatures, the pair plans to include other compounds in their experiments that could contribute to the coloring of the Great Red Spot.